Indonesia and India followed their lead in tourist spendings. This chart from the Singapore Tourism Board (STB) shows that China tops Singapore’s tourism receipts (TR) as Chinese visitors spent $1b in Q1 2018. According to data from STB, 51% of Chinese tourist spending go to shopping. They also spend on other TR components such as airfares on Singapore-based carriers, port taxes, local transportation, business, medical, education and transit visitors (23%), accommodation (19%), and the least for food (7%). Indonesia and India followed China’s lead with tourism receipts hitting $652m and $330m, respectively, for Q1. 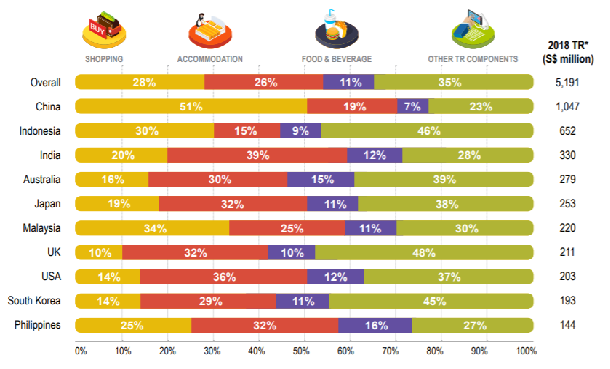 Overall, tourists spend the most on other components (35%) when they go to Singapore. This is followed by shopping (28%), accomodation (19%), and food and beverage (7%).